These are the most effective techniques from Reddit and YouTube. 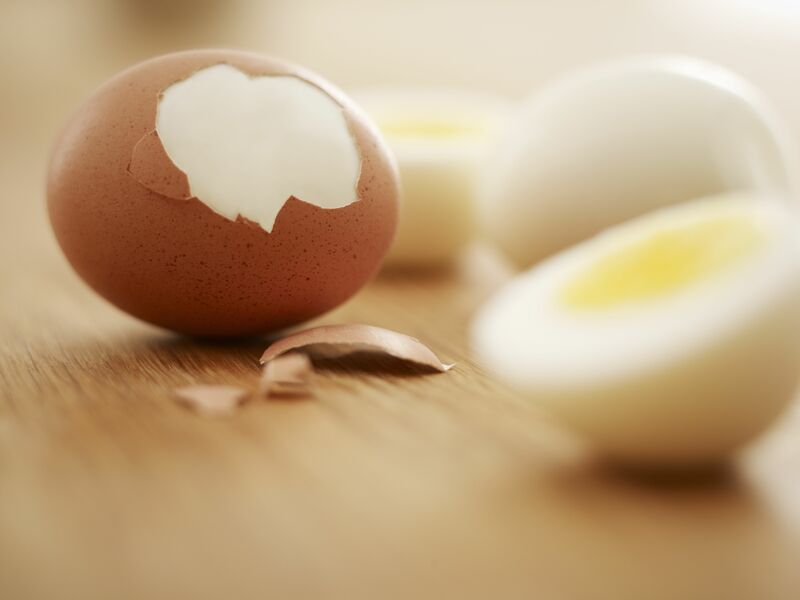 Whether you like them sliced over avocado toast or mixed into a green salad, hard-boiled eggs are a fast and easy way to get more hunger-curbing protein into your diet. However, peeling egg from the shell isn't so speedy and simple. Here's how things usually go: You tap the egg with a spoon and the shell cracks. You pick off each little shard and remove most of the egg white in the process. To make the process a little less frustrating, we curated tips from the Internet, including Reddit and YouTube, and found the most reliable methods. For starters, when you hard boil an egg, be sure to use an older egg. Old eggs are easier to peel than fresh ones. 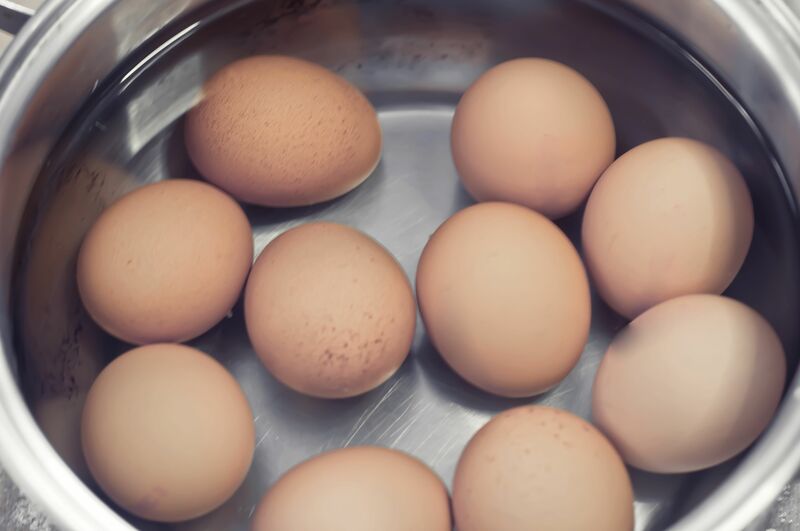 That's because there's an air cell between the egg and the inside of the shell, and that cell increases in size the longer an egg is stored. As the air cell gets bigger, the egg gets smaller, contracting and pulling away from the shell. Ultimately, this makes the egg easier to peel. Here are five popular tricks that make peeling hard-boiled eggs easy breezy-we even tested a few techniques ourselves! Several cooking sites suggest adding baking soda to the pot of water. Apparently, baking soda raises the eggs' pH level and makes them easier to peel. You simply add 1/2 teaspoon of baking soda to a quart of water and then follow the usual steps of hard boiling an egg. Once the egg is cooked, you should be able to peel the shell of in larger pieces, making the process easier and faster. 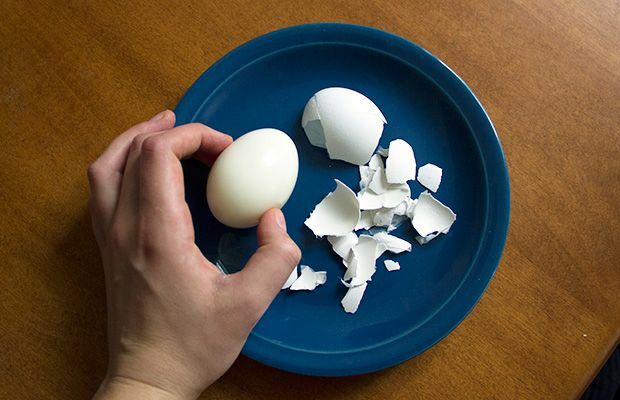 This hack from Reddit is simple: Roll the the hard-boiled egg back and forth until small cracks begin to appear. Stop when your egg resembles a mosaic, and then start peeling the shell from the larger end of the egg. So you don't burn yourself, peel the egg while running it under cold water. Here's how it's supposed to work: First, crack the shell at the very top and bottom of the egg, then peel off about a 10c piece-sized hole on each end. Next, place your mouth over the hole at the top of the egg and blow with all your might. The egg should slip away from the shell and into your waiting hand, according to several YouTube tutorials. The original YouTube video demonstrating this method has more than 21 million views. You put your cooked egg into a small glass with a little bit of water. Cover the top of the glass with your hand, and then, over the sink, shake it like crazy. The egg shell will take on dozens of tiny cracks so the shell slips right off. We tried this trick, too, and it works like magic. Five seconds of shaking yielded a shell so fractured that it came off with hardly any effort-and the egg beneath was smooth and perfect. Another Reddit recommendation, the spooning method is one of the trickier techniques. 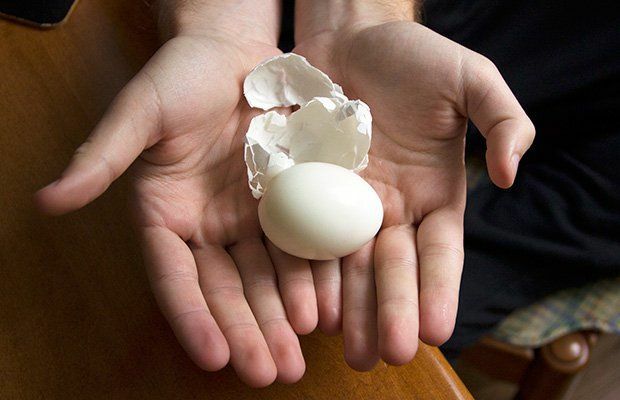 Start by hitting the egg on a hard surface to create a substantial crack. Then, grab a spoon and wedge it between the shell and the egg-careful not to dig to too deep. While the spoon is still in there, rotate the egg until the shell is completely separated. And voilá, you should have a perfectly peeled hard-boiled egg.